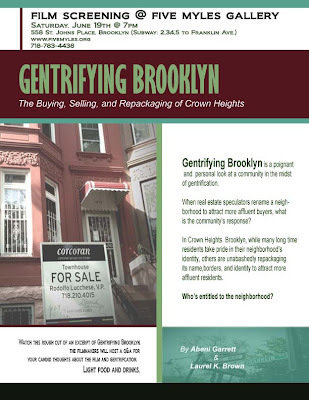 Two of the neighborhood's most involved, interesting, and thoughtful bloggers, Laurel B and Abeni G of Nostrand Park, have co-produced a film entitled Gentrifying Brooklyn: The Buying, Selling and Repackaging of Crown Heights, and they're screening it at Five Myles Gallery on Saturday night. I've copied their blurb below, and if you click on the flyer above you can see all the necessary information, but suffice to say that I'm very much looking forward to seeing what they've captured in this film. The “Crown Heights vs. Prospect Heights” debate is often played out online, through spaces like Brownstoner and Brooklynian. It’s a hot topic. But how does this naming (or renaming) affect the residents? With a keen focus on Franklin Avenue – the neighborhood’s “contested border” – myself and another Crown Heights resident have interviewed dozens of area resident to get their opinion on the debate. We've interviewed newcomers, long timers, random people, and even some of your favorite local business owners to inquire about their opinions on and what they think their role is in the changes in the neighborhood. Gentrifying Brooklyn is a poignant and personal look at a community in the midst of gentrification. When a neighborhood is renamed to attract more affluent buyers, what is the community response? In Crown Heights Brooklyn, while many long time residents take pride in their neighborhood’s identity, others are unabashedly repackaging its name, borders, and identity to attract more affluent residents. Who’s entitled to the neighborhood? A film by Abeni Garrett and Laurel Brown. A rough cut of an excerpt of the film will be screening at Five Myles on Saturday, June 19th at 7:00 p.m. We will then open up the floor for discussions and critiques about the film. Also, we are going to be engaging the audience in questions about the neighborhood changes more generally. We want this to be an opportunity to our community to share a meaningful conversation with each other about the neighborhood. Thanks for the shout Nick! Even though this is going to be a rough cut of an excerpt, it should be interesting. And hopefully the discussion will be lively. Also, food is generously being provided by Joey's Gourmet Lunchboxx at 707 Nostrand Ave. Gotta be there early, though. I hope there will be another screening this summer as I can't make it Saturday! Yes, we are arranging additional screenings. This particular screening is going to be a rough cut of an excerpt, and we are going to focus on getting the community's input on the film and the topic more generally so - it should be very dynamic. Funny enough, we had one person say that she wasn't sure if she wanted to come because she didn't want to be the only white person in the room. Based on the outreach that we have done, we are expecting to draw a mixed crowd. EVERYONE IS WELCOME. Also, just found out that Super Wings is going to be sponsoring some of their coveted wings as well!! So for those who can make it out on Saturday, definitely come through. Great to hear about the film! Seems like a lot of these issues are being played out on this blog. There is much cultural conflict between the older and newer residents as the two adapt to each other's presence.